UK officials are talking to Microsoft over fears the new version of Windows could make it harder for police to read suspects' computer files. Windows Vista is due to be rolled out later this year. Cambridge academic Ross Anderson told MPs it would mean more computer files being encrypted. He urged the government to look at establishing "back door" ways of getting around encryptions. The Home Office later told the BBC News website it is in talks with Microsoft. Professor Anderson, professor of security engineering at Cambridge University, was giving evidence to the Commons home affairs select committee about time limits on holding terrorism suspects without charge. He said: "From later this year, the encryption landscape is going to change with the release of Microsoft Vista." The system uses BitLocker Drive Encryption which can be linked to a chip called TPM (Trusted Platform Module) in the computer's motherboard. The system is aimed at preventing tampering with computers but it would also help prevent people from downloading unlicensed films or media. "An unfortunate side effect from law enforcement is it would be technically fairly seriously difficult to dig encrypted material out of the system if it has been set up competently." Professor Anderson said people were discussing the idea of making computer vendors ensure "back door keys" to encrypted material were made available. The Home Office should enter talks with Microsoft now rather than when the system is introduced, he said. He said encryption tools generally were either good or useless. "If they are good, you either guess the password or give up," he said. The committee heard that suspects could claim to have lost their encryption key - although juries could decide to let this count this against them in the same way as refusing to answer questions in a police interview. A Home Office spokesman said: "The Home Office has already been in touch with Microsoft concerning this matter and is working closely with them." Increased awareness about high-tech crime and computer crime has prompted the Home Office to talk to IT companies regularly about new software. Government officials look at the security of new systems, whether they are easy for the general public to hack into and how the police can access material in them. A Microsoft spokeswoman said Windows Vista was designed to be the most secure version of Windows yet. She said: "It is our goal to give PC users the control and confidence they need so they can continue to get the most out of their PCs. "At the same time, we are working with law enforcement to help them understand its security features and will continue to partner with governments, law enforcement and industry to help make the internet a safer place to learn and communicate." The system, part of what is called "trusted computing" mechanisms, is designed to stop malicious programs being installed surreptitiously on computers. The Trusted Computing Group has been working for some years on a hardware-based system which is built into the motherboards of many Intel-based computers. 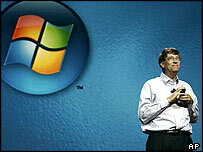 But most people will not be able to use its features until Microsoft Windows Vista is launched. Critics say the companies behind most trusted computing want to use digital rights management to ensure users cannot use programs they have not approved.